I queued for two long, cold, hours to buy a ticket at the Royal Academy to see their latest block-buster exhibition, Painting The Garden: Monet to Matisse. It was worth it despite what cynics say about the Impressionists, dismissing them as chocolate box pretty. The show sated my hungry eye. I hadn't realised before that modern garden design had been invented by the Victorians. They took great delight in importing new breeds of flowers called Chrysanthemums from Japan and painted great masses of them growing in profusion in their French gardens. Roses barely got a look-in. I knew about that great British garden design innovator, Gertrude Jekyll, whose wonderful portrait hangs in the National Portrait Gallery - and this exhibition had a lovely painting of her gardening boots. She was a well-heeled Victorian middle class lady who had trained as an artist but started to lose her sight early in adulthood and switched her creative impulses to designing gardens. She introduced the idea of swathes of colour in wide borders that had dramatic effect. But their wasn't much about her in this exhibition, which was about French painters. 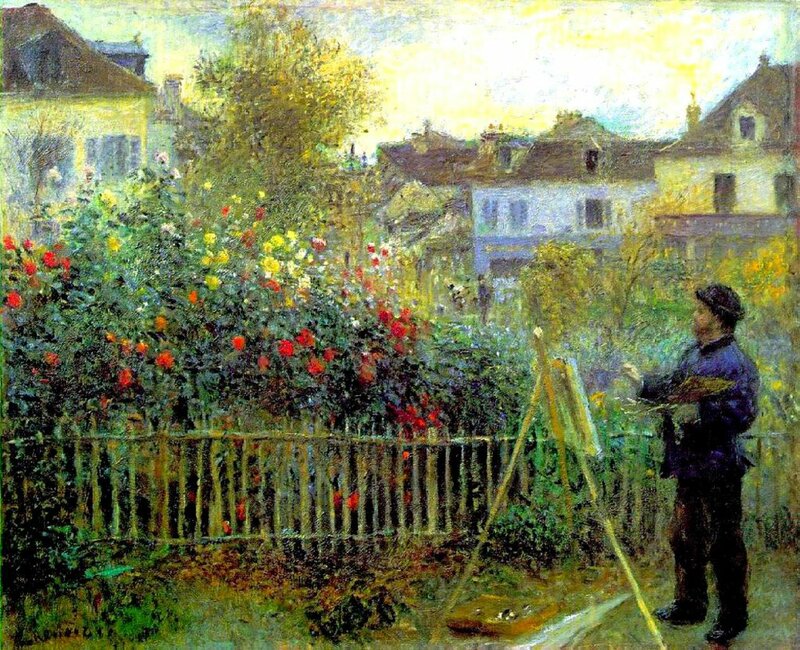 Now as an artist, a garden presents me with the problem of too great a complexity. You can't paint every leaf on a tree separately, can you? Well this exhibition proved me wrong! The Impressionist's paintings were made up of a myriad of flecks of colour. Many of the images were overwhelming in this respect, with barely a line to be found anywhere. They were almost Pointillist and hard to look at. After a long run of paintings of Chrysanthemums, the exhibition documented Monet planting his garden from seedlings he'd brought on himself. He dug his pond, planted the fancy new water lilies he'd imported and had a curved bridge made to cross it, looking like the bridges in Japanese prints. The exhibition showed a few of the original prints he collected from the famous Japanese print-makers, Hiroshige and Hokusai. Then he started painting from life in his garden, in the wind. There was a looped video recording of this, like a moment caught in time, somehow sad. His subsequent canvases show the growth of lilies across his pond meeting a curving weeping willow, the reflections of the sky in the water and the different moods of the seasons. The first world war came and he refused to flee. Paintings by Matisse and Bonnard, Sisley and Manet, Van Gogh and early Vuillard, all were male except for a single painting by the American Impressionist living in Paris, Mary Cassatt. And yet over half the audience in the RA were women.